How Do Eagles Learn To Fly? 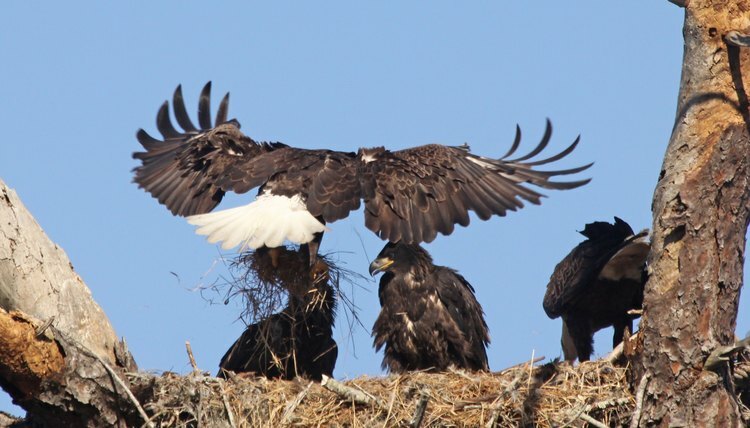 Young eagles learn how to fly from their parents and by practicing near their nest. One of the main ways they practice is by spreading their wings and jumping to a nearby branch. In the case of orphaned eagles, expert bird rescuers can provide them with a safe learning environment until they learn to fly and can return to the wild. Eagles are raptors, birds of prey. 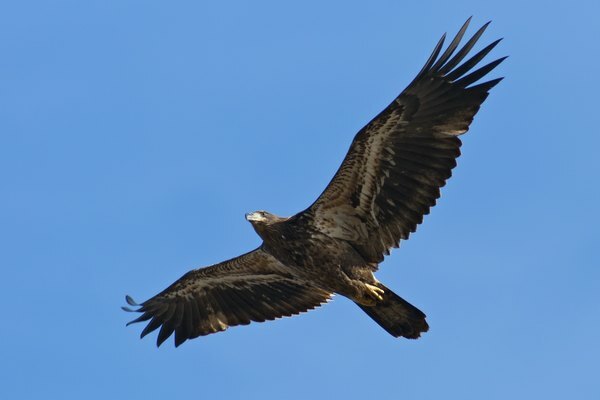 Among the most recognizable eagles in the U.S. are the bald eagle and the golden eagle. They have keen eyesight and the ability to glide as they fly so they can catch sight of food. Eagles generally roost and nest in high places, such as the tallest tree in their territory, but when trees aren't available some species nest on rocks, cliffs, structures or on the ground. A male and female eagle usually mate for life. Nesting building is part of their courtship. At maturity, their offspring will return to the nest where they took their first flights. A baby eagle is called an eaglet. Until they are able to fly, they depend on their parents for everything. Their dull coloring helps to camouflage them from predators. In the nest, the eaglets stretch their wings and hop, gaining strength and balance as they grow. Young eagles spread their wings and hop out of the nest to a branch of the tree they're in. At first, they hop to the closest branches, flapping their wings. The movement is more like jumping than flying. This exercise is called branching and helps them improve their coordination and balance. The eagle's first flight away from the nest is called fledging. Golden eagles fledge at 7 to 11 weeks of age and bald eagles at 10 to 14 weeks. The young birds minimize their risk of injury and exercise at their nest until they are strong enough to become airborne, imitating their parents to use their wings in real flight. Young eagles learn by imitating the adult birds. Once the young eagles are flying, they still have a lot to learn before they can survive on their own. They'll fly away from the nest learning to hunt and keep returning to the nest for weeks. Without parents, eaglets need expert care and guidance to learn to fly and become able to survive on their own. Avian Haven, a bird rehabilitation sanctuary in Maine, raised orphaned eaglets with an adult eagle to serve as a role model The facility has a large flying area designed for raptors. Watching an adult fly and copying all the moves -- taking off, flapping, gliding, landing, and perching — helps the young birds get it right. Without a safe place to learn and lessons in flight, an eagle won't learn how to fly.